What type of raw food should I feed my dog? How much food should I feed at one time? Where do I buy raw food for my dog? What eating space is required? How do I switch my dog from kibble to a raw food diet? Not to worry. I’ll answer all of those questions for you on this page. By the way, if you haven’t already, I recommend you go back and read Page 1: Raw Food Diet For Dogs before you continue. When feeding a raw food diet to your dog, you should keep in mind how a dog would eat in the wild. Dogs are opportunistic animals and will eat just about anything that contains meat, but wild dogs also eat plant matter such as occasional fruits and vegetables. They eat eggs and fish when they have the chance. They also eat partially-digested vegetable matter in the stomach and intestines of their prey. Whole vegetables can pass too quickly through a dog’s digestive system to be of much nutritional value for them but when they are already partially-digested by other animals, vegetables can provide important nutrition for canines. So, it may seem kind of gross to think about dogs eating the stomach contents of other animals, but this is an important source of vitamins and minerals for them. So, while many dogs like to munch on raw carrots when you offer them, and they can be a nice treat, your dog won’t derive much nutrition from them or other vegetables unless they are broken down in some way first. When veggies are broken down first by pureeing to mimic a prey animal’s digestion, for example, they are a good part of a dog’s raw diet. Really, any kind of meat can be used. In addition to the above, you’ll also want to feed various organs such as liver, kidney, tripe, and heart. Dr. Ian Billinghurst, a pioneer in feeding raw food to dogs, recommends that people following a BARF (biologically appropriate raw food or bones and raw food) diet feed about 60 percent raw meaty bones (RMB) and 40 percent vegetables and other food (eggs, organs, and so on). The percentage of raw meaty bones can vary upward a little, but you still need to include organ meat and some vegetable matter, as well as a few other foods to ensure proper nutrition. The ideal amount to feed is normally about 2 percent of your dog’s total body weight daily. So for example, a 50lb dog would require about 1 lb (0.45kg) of raw food per day. This amount can be separated and fed in a morning and evening meal, so you would feed about 8 ounces (½ pound) at each meal. Growing puppies will need more food – about 10 percent of their body weight per day. This can be fed in 3 meals. Remember that every dog is different so you will need to watch your dog’s weight and condition and adjust the amount you feed once you see whether he is gaining or losing any weight. It’s always important to use fresh ingredients when you are feeding your dog a raw diet. However, there is nothing wrong with pre-mixing some parts of your dog’s meal ahead of time. Obviously, raw foods won’t keep long even in the refrigerator, but you can make up enough food (raw meaty bones such as chicken wings, some pureed veggies, a couple of eggs ready to add, and some yogurt, perhaps) and have it ready to mix for your dog’s meal and keep it in the fridge. Planning meals ahead of time makes raw feeding easier, as does buying food in bulk when it is on sale. You can look for family-sized packs of chicken, beef, pork, and other meats when they are for sale in the store. Or, if you have more than one dog, you may want to talk to a local meat seller or grocer to see if you can buy in bulk. Many places will sell 40 lbs of chicken or turkey at a lower cost. You just have to have a way to freeze it. 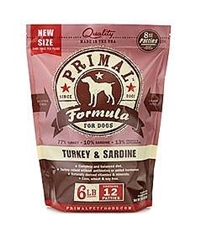 It’s important to try to feed your dog a variety of meats and other ingredients so he will get all of the amino acids and vitamins and minerals he needs in his diet, so be sure to buy different meats and fish when you can. You don’t have to make every meal different, but over the course of a week, your dog should get a wide variety of different meats and other foods. It’s also very important to feed bone along with the meat. Don’t make the mistake of only feeding your dog meat with no bone. Most raw bones are soft enough for a dog to consume and they provide great nutritional value to them. Some raw feeders grind bones for their dogs with a meat grinder but this is usually done only when a dog has a health issue that prevents them from being able to chew and digest raw bones. In addition to raw meaty bones which should make up about 60 percent of your dog’s raw diet, you will need to provide raw vegetables which are broken down for your dog. You can do this by using a food processor, blender, or juicer. This is because dogs can’t digest vegetables while the cellulose in them is still intact. In the wild, prey animals break down this cellulose when they digest the vegetable matter and the dogs can get nutrition from the veggies when they eat the stomach and intestines of these animals. But we have to do this for our dogs so they can get vitamins and minerals from the vegetables. Other food that should be added to your dog’s raw diet includes organ meat such as kidneys, heart, liver, and tripe (stomach lining). These are very rich meats that are high in vitamins. Your dog doesn’t need a lot of organ meat because it is so rich and you don’t have to give it with every meal but you should feed it at least several times per week. You should also give your dog some raw eggs occasionally. Many people like to dry and powder the eggshells for some extra calcium. 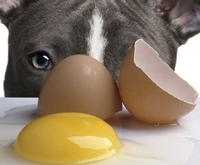 Eggs are very rich so you don’t have to include them on a daily basis, but they are very good for your dog. You can also add yogurt to your dog’s raw food. It’s an excellent probiotic and helps with digestion. It contains healthy bacteria that keeps your dog’s gut functioning as it should. Be sure to use plain yogurt and not something that contains flavors or sugars. Whole yogurt is better than low fat or fat free – it contains more calcium. If your dog is not eating fish regularly, you may want to add fish oil or fish oil gel tabs to your dog’s diet. Fish oil is high in omega 3 fatty acids which are good for his skin and coat. Some people add flax oil seed for this purpose but fish oil is a better source. You can add other supplements to your dog’s diet when you feed a raw diet but that’s really up to you. Just be sure that your dog is getting all of the trace minerals he needs in his diet, as well as all of the normal vitamins and minerals he needs. Watch his condition carefully and if you see any signs that he appears to be nutritionally deficient in any way, you may need to adjust his diet. You can even add a little fruit to your dog’s diet. Your dog won’t derive a lot of nutrition from fruit but most dogs like some apple slices, pieces of banana, or pieces of pears. (I have a dog who loves oranges.) Berries, however, are a great source of antioxidants. Blueberries and cranberries can be very good for dogs when added to a raw food diet occasionally. Finding raw food for dogs is pretty simple if you live near a populated area. Often times a butcher shop has scraps and leftovers they are willing to sell for cheap as the scraps are not normally sought after by humans. But dogs love it and you know the meat has come from high quality sources (as long as you trust your local butcher shop!). You can often times find chicken necks, turkey necks, chicken or turkey feet, liver, hearts, pork necks and riblets, tripe or other stomach contents, cow tongue, and many other meat products which are difficult to sell. If you can find the right butcher, you can obtain these meat products for cheaper than you buy your kibble. Call around, you might be very surprised with what your butcher has! And, of course, there is always your local grocery store or big box store. For the most part, you should buy your dog the same meats you would feed your own family if you want to feed your dog a good diet. Is Feeding Raw Meat To A Dog Messy? Yes, it certainly can be. Dogs are not very neat when they are eating raw meat. 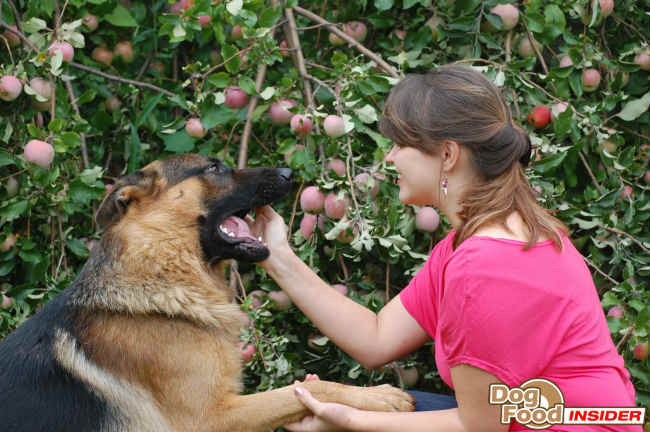 The best place to feed your dog on a raw food diet is your backyard if possible. Other people will have an area in a room with a small tarp on the floor making it easier to clean. Other people will use their garage, an area of an outside deck, or an unused room. Or you can feed your dog in his crate which keeps the mess confined to a smaller area which is easier to clean. This is obviously one of the disadvantages to a raw food diet for dogs. It can get a bit messy and if you feed something like a whole rabbit, you almost certainly don’t want that in your house while it’s being consumed! When switching between different types of kibble, it’s widely known that you should slowly mix the new food with the older food and gradually increase the amount of the new food. This helps to avoid any digestion problems like vomiting or diarrhea. However, when switching to a raw food diet, it needs to be done “cold turkey.” Reason being, cooked food and raw food is digested quite differently. By feeding both, it will force your dog’s body to digest two completely different types of foods in two completely different ways. So when switching to raw food for dogs, you want to make the switch a quick one. Be aware that there is a break-in period. Some dogs will adapt to the raw diet immediately while others will take several weeks to adjust. Typically, the longer the dog has been on kibble the longer the adjustment period will be. During this adjustment period, you can expect some diarrhea, constipation, and sometimes occasional vomiting. While a bit unpleasant, this is nothing of serious concern and the symptoms will eventually subside. Once the symptoms do subside, you and your dog can enjoy benefits to a raw diet for the rest of your dog’s life. When making the switch it’s important that you feed your dog a relatively bland diet at first. Feed raw meaty bones and some bland vegetables such as chicken wings and squash or pureed carrots, for example. Don’t start feeding richer raw foods, such as organ meats or eggs until your dog has begun to adjust to eating raw foods. Preparing raw food for dogs can be a scary step to make for most dog owners. The health benefits to your dog, however, can be amazing. This is a must read.